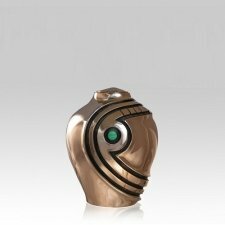 The Matador Malachite Bronze Keepsake Urn with a Malachite stone insert is made from solid bronze with a wonderful, polished finish. The urn is made by one of the leading sculpture artists in America. The smaller size is ideal for families who are sharing a small portion of remains. This keepsake urn can create a memory of your loved one with peace. Top opening, can be sealed with adhesive. "I was very pleased with the necklace which holds my son's ashes, along with the chain which is of very high quality. The price was very reasonable after having compared prices with other competitors. I was extremely pleased that once I placed the order, that it came very quickly in the mail."